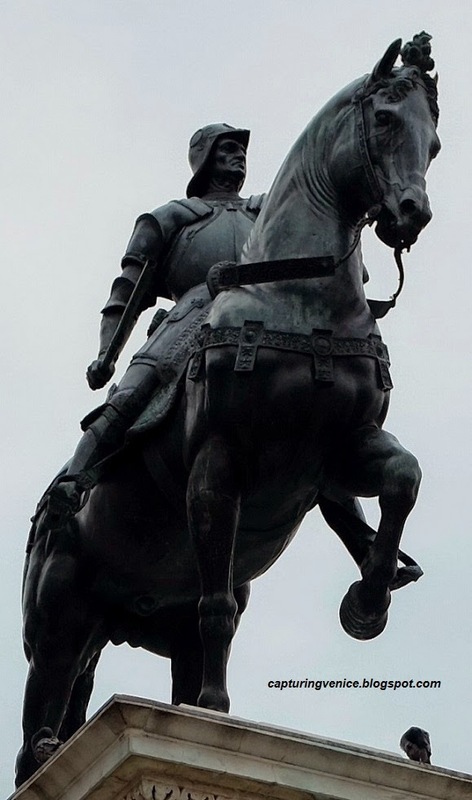 My first encounter with a condottiere was in Padova when I first met Donatello's stunning equestrian monument to Gattamelata outside the Basilica di San Antonio. A condottiere is the leader of band of mercenaries, who were hired by the various Italian states to fight one another from the mid 14th century to the 16th century. I was struck first by Donatello's modelling of the celebrated mercenary, and then by that mercenary's name - 'The Honey Cat'. Venice's monument to the mercenary Bartolomeo Colleoni is here in Campo San Zanipolo, outside the former Scuola Grande di San Marco and the Gothic cathedral of SS Giovanni e Paolo. Colleoni began his career in the 15th century in Venice's army (serving under Gattamelata). He later defected to Milan, where he was jailed, then escaped to re-enlist in the Venetian army. The final years of his career were notably peaceful in Venetian history, so he spent his middle years in relative luxury and wealth. When he died in 1475, he bequeathed 700,000 ducats to the Venetian state, on the proviso that it had to erect a monument in his honour in front of San Marco. Those wily Venetian bureaucrats took Colleoni's will to mean that he wanted his monument to be placed in front of the Scuola di San Marco, not the Basilica di San Marco. Andrea Verrocchio was awarded the commission in 1481, but after commencing work on the equestrian part of the monument, he heard rumours that another artist was being courted to produce the rider. Enraged, he smashed his horse and returned to Florence. He was invited back to start afresh but died in June 1488 before the work was completed. Alessandro Leopardi was then hired to complete the monument and the high plinth on which it stands. Leopardi took the name 'del Cavallo' and signed his name to the horse and the plinth. Verrocchio (why have only one 'r' when you can have two?) made a superb model of the horse. The Signoria liked it, but decided to give the work of producing the rider to another sculptor. Verrocchio lost his temper, smashed the head off the horse and left Venice. The Signoria warned him never to set foot in Venice again, at peril of his life. Verrocchio replied by letter that he had no intention of going back to Venice. He pointed out that if the Signoria cut off his head, they could not replace it with another. He, Verocchio, could, on the other hand, easily make another head for the horse and, he added with guile, he could make it even better. The Signoria invited him back to Venice to finish the statue. They even let him sculpt the rider. Even though the horse and rider was Verrocchio's work, he died before it was cast. Leopardi did the casting and took all the credit by carving his name on the horse's saddle girth. Verrocchio never saw Colleoni. Love your comments, Bert! Thanks for your detailed further information!